The following is taken from “Presbyterian Worship” by Edmund Clowney in Worship: Adoration and Action (page 117), edited by D.A. Carson. 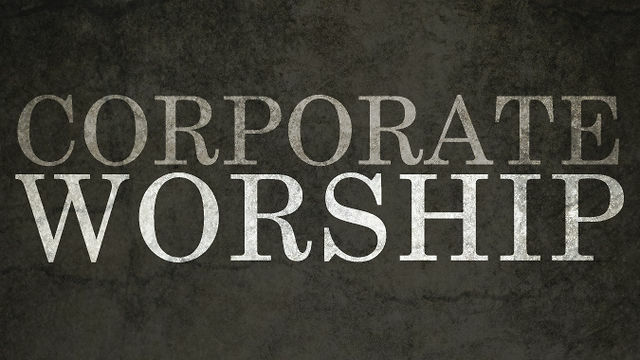 Although some may skibble over certain aspects of this composition, Clowney provides a succinct summary of the elements of corporate worship according to the New Testament’s testimony. (I have reformatted his collection into a bulleted list.) He states, “The New Testament indicates, by precept and example [emphasis mine], what the elements of [corporate] worship are.” According to Clowney, they are the following. Corporate prayer is offered (Acts 2:42; 1 Tim 2:1; 1 Cor 14:16). Scripture is read (1 Tim 4:13; 1 Thes 5:27; 2 Thes 3:14; Col 4:15-16; 2 Pet 3:15-16. Scripture is expounded in preaching (1 Tim 4:13; cf. Lk 4:20; 2 Tim 3:15-17; 4:2). There is a direct shift from the synagogue to the gathering of the church (Acts 18:7, 11; cf. 19:8-10) [I would also want to note James 2:2 and its use of “synagogue”]. The teaching of the word is also linked with table fellowship (Acts 2:42; 20:7; cf. vv. 20, 25, 28). The songs of the new covenant people both praise God and encourage one another (Eph 5:19; Col 3:15; 1 Cor 14:15, 26; cf. 1 Tim 3:16; Rev 5:9-13; 11:17f; 15:3-4. Giving to the poor is recognized as a spiritual service to God and a Christian form of “sacrifice” (2 Cor 9:11-15; Phil 4:18; Heb 13:16). The reception and distribution of gifts is related to the office of the deacon (Acts 6:1-6; Rom 12:8, 13; cf. Rom 16:1-2; 2 Cor 8:19-21; Acts 20:4; 1 Cor 16:1-4). and to the gathering of believers (Acts 2:42; 5:2; 1 Cor 16:2). The faith is publicly confessed (1 Tim 6:12; 1 Pet 3:21; Heb 13:15; cf. 1 Cor 15:1-3. The people receive God’s blessing (2 Cor 13:14; Lk 24:50; cf. Num 6:22-27). The holy kiss of salutation is commanded (Rom 16:16; 1 Cor 16:20; 2 Cor 13:12; 1 Thes 5:26; 1 Pet 5:14). The sacraments of baptism and the Lord’s Supper are explicitly provided. Confession is linked with baptism (1 Pet 3:21). A prayer of thanksgiving is linked with the breaking of break (1 Cor 11:24). Now, how about some of those skibbles? Or, if you think something’s missing from this list, I’d love to hear. Leave a comment below.